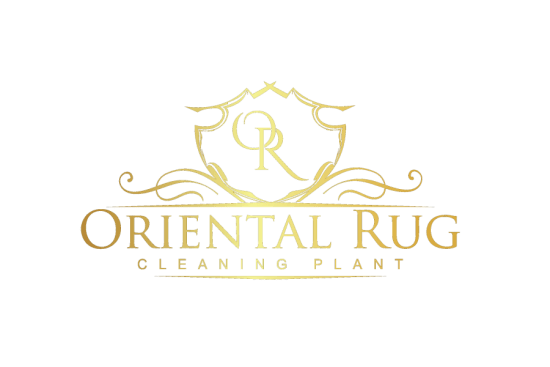 Here at our Oriental Rug Cleaning Plant, we perform a full immersion washing process on all of the area rugs we clean. 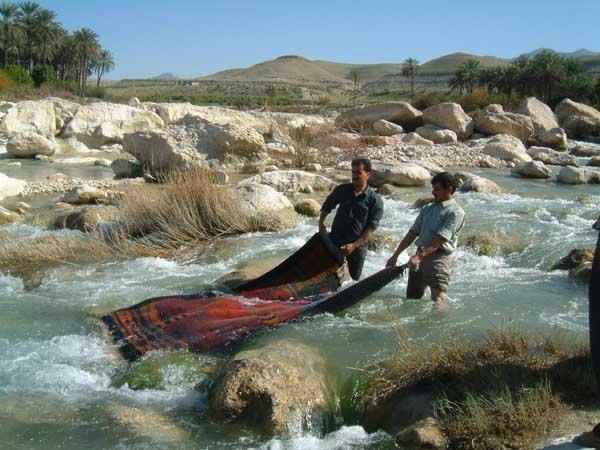 This service is meant to replicate the “River Wash” area rug washing technique that has been carried out since the first area rugs were woven, and is even still carried out today in some areas of the world. When people would wash their area rugs in a river, this was a way to clean the rugs thoroughly while also keeping the fibers from being subjected to excess abrasion which caused early deterioration. 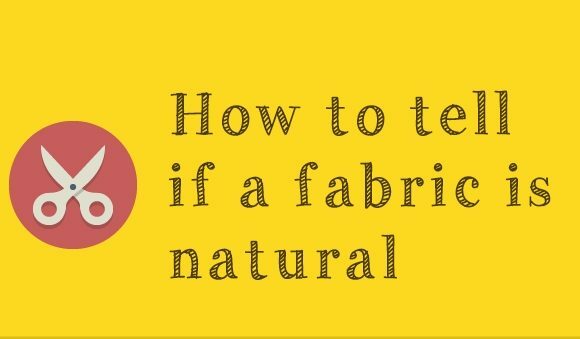 Essentially, this is a safe and thorough method for treating all types of natural fiber area rugs. 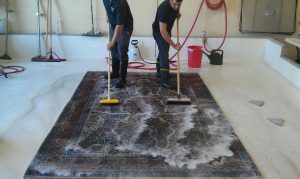 To replicate this process, your rug is laid out on a custom built floor where we can thoroughly flush the rug safely throughout the entirety of the cleaning. Flushing the rug helps to naturally agitate the rug fibers which helps to loosen up any dirt or debris that resides within the area rug. As the debris is loosened from the fibers, it is carried away with the running water. This is a natural result of the flow of the river water when carrying out a river wash. So, with using a custom built tank, pump and hose system, we can actually replicate this process in our facility. Using a hand operated orbital machine, the technicians have the added benefit of being able to pull any remaining dirt or debris that still resides at the base of the rug out. This delicate and effective cleaning process helps us to yield fantastic results with each rug we treat. Our process is a highly professional service that can only be carried out by a trained professional in a facility using high end equipment. This type of professional cleaning is typically recommended to be carried out every one to three years, depending on the individual usage of your area rugs. However, there are circumstances that will call for an impromptu professional rug cleaning service. While it is unfortunate, spills or random messes can and most likely will occur. When you do have an unfortunate accident involving your area rug, whether the rug is natural or synthetic, you need to act quickly. Depending on the nature of the accident, the fibers of your area rug could be subject to different types of damage. Fiber damage typically shows itself in the way of permanent staining. This can happen with standard wear and tear, foot traffic typically being the main culprit. Besides regular wear caused gradually by foot traffic, accidental messes are an unfortunate byproduct of life itself. When you do have an accident on your in home area rug, you can act quickly to help reduce the possibility of permanent damage. Once you have completed your initial in home clean up, the next step would be to have a professional cleaning service carried out. Regular maintenance will help to extend the life of your area rug, but proper accident treatment will also help to keep your rug looking as good as possible for the remainder of the rug’s life. We always love to do what we can to help our customers stay informed and equipped with the knowledge of what it takes to treat and maintain their coveted area rugs. 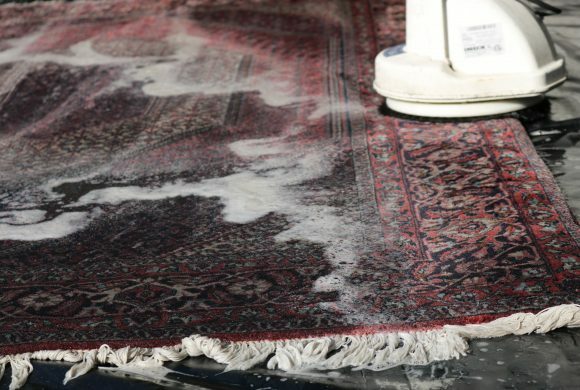 Sometimes in these posts, we like to share some information that helps to achieve these goals of proper rug maintenance. Below, we will provide some information that we think will help with your maintenance routine needed to keep your area rug looking and feeling good and fresh for as long as possible! Take your fleece floor covering outside. Shake off any free soil or tidy that has amassed on your mat since getting it or cleaning it last. Earth and clean rubbing against floor covering filaments really end up being harming to the nature of the carpet over time. Make certain that it is dry wherever you shake it out. Shaking a wet floor covering can additionally install the earth you are attempting to expel. In the event that conceivable, assign a region where you can hang a clothesline and hang the fleece mat that way. Beat against the floor covering with a sweeper to help shake it clean. Run a vacuum over your mat. Vacuum the carpet in a V type shape to interchange the vacuum’s heading and counteract pulverizing the filaments of the fleece floor covering. Rehash this 3 times over the fleece mat. 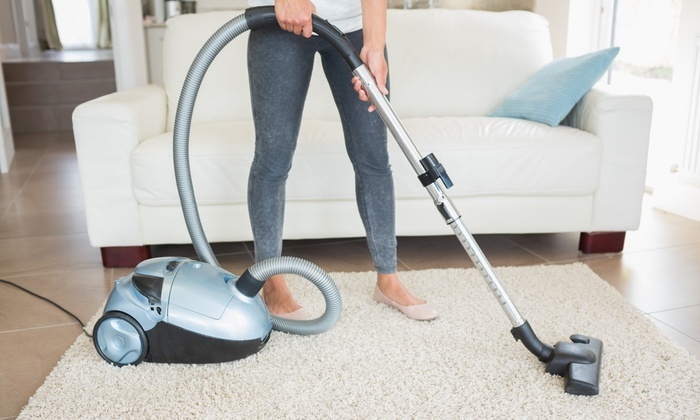 To shield soil from working up and installing itself in your sensitive floor covering, at any rate, you ought to vacuum consistently: twice per month. Vacuum the underside of your fleece mat once at regular intervals. Ensure the vacuum has a setting of a high tallness to abstain from fomenting the mat unnecessarily. 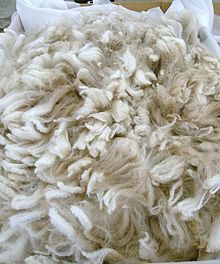 Shrinkage, heaping, and general harm to the fleece strands can be a consequence of fomenting the carpet excessively. Wash the mat once the greater part of the soil has been expelled. Wipe the floor covering with cool water and a gentle fluid cleanser or carpet cleanser. Wash the edges of the floor covering with a similar arrangement. Ensure that you wet the mat, giving careful consideration to the snooze of the floor covering. When you brush your hand against a mat toward the external edge in direct movements, one side will feel harsh and the opposite side will feel delicate. The delicate side is the rest side. Apply the foamy water toward the snooze side. To complete the activity, flush all the lathery arrangement off the floor covering altogether with water. Ensure all cleanser is out of the mat before proceeding to the following stage. 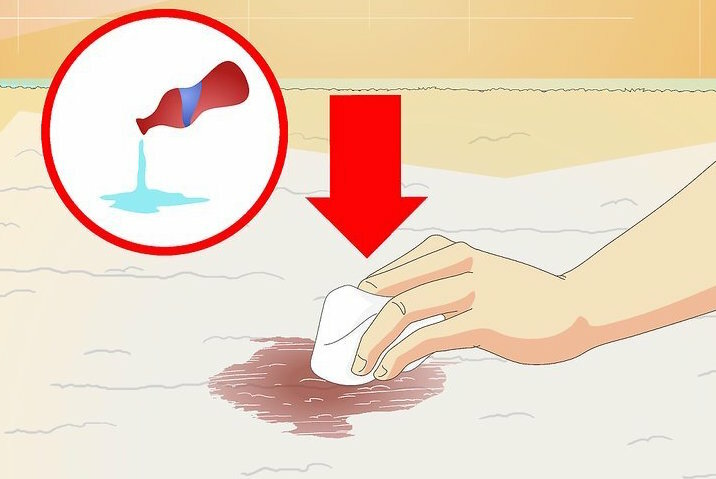 Dry your floor covering quickly. Fleece floor coverings require a broad dry so do your best to dispose of any abundance dampness on the mat by crushing it out or hanging it out to dry under the sun. Never put them in a dryer, yet don’t hesitate to utilize warmers to help encourage its drying speed. Once the rest of the carpet is dry, turn it over, and dry the back of the floor covering. Ensure the two sides of the mat are totally dry before setting it back on the floor. In the event that the material feels solid subsequent to drying, vacuum the carpet once again or brush it tenderly to bring a portion of its delicate quality back. We do hope that this information will help you to keep up with your proper maintenance routine for your beautiful in home area rugs. However, don’t forget to have your professional cleanings carried out in a proper facility every one to three years, or whenever there is an unfortunate accident. 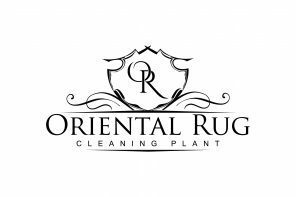 Our Orlando Rug Cleaning professionals are always ready to help answer any questions you may have, or to provide a fantastic service on your beloved area rugs! Why Are Oriental Rugs So Expensive?Putting The Customer First!